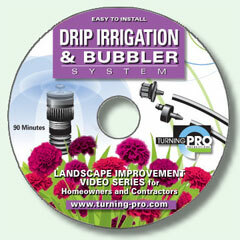 In this simple to understand video turning Pro professionals will show you how to install a drip emitter system and a bubbler irrigation system for trees, shrubs, groundcovers, flower beds and vegetable gardens. A drip irrigation and bubbler system will provide efficient watering delivered directly to the plant root zone. This type of system will promote optimum growth through deep and slow watering while minimizing weeds in planting areas. You will see how to install all equipment for the drip and bubbler system. We will also take you through simple steps to calculate gallons of water required for drip valve zones. A drip system will make yard care easier and will encourage a healthy growth habit for your plant material. We will also demystify irrigation equipment and products and show you how to select the right type and size of equipment for your system. All the steps you will see are tried and true installation techniques perfected by highly experienced landscape professionals over the course of many years. Each step is fully described and illustrated. From the planning stage to buying materials to testing the system, you will gain the confidence and skill necessary to install your own drip and bubbler irrigation system.